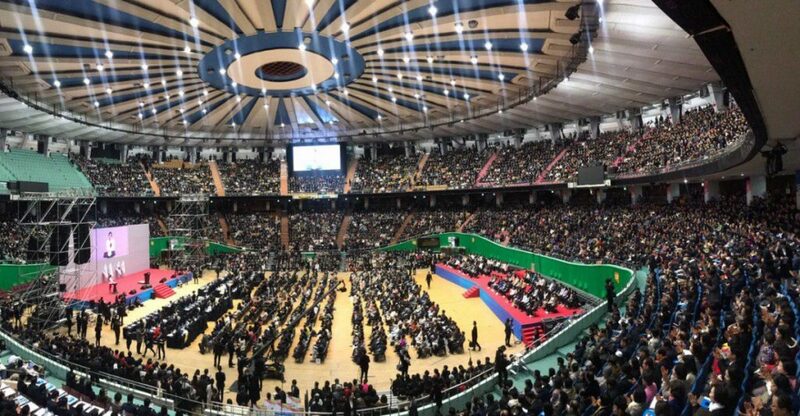 On March 14th, Heavenly Culture, World Peace, Restoration of Light (HWPL) held the 3rd Annual Commemoration of the Declaration of Peace and Cessation of War (DPCW). Around 30,000 participants who want peace were gathered to support the legislation of the DPCW as international law. 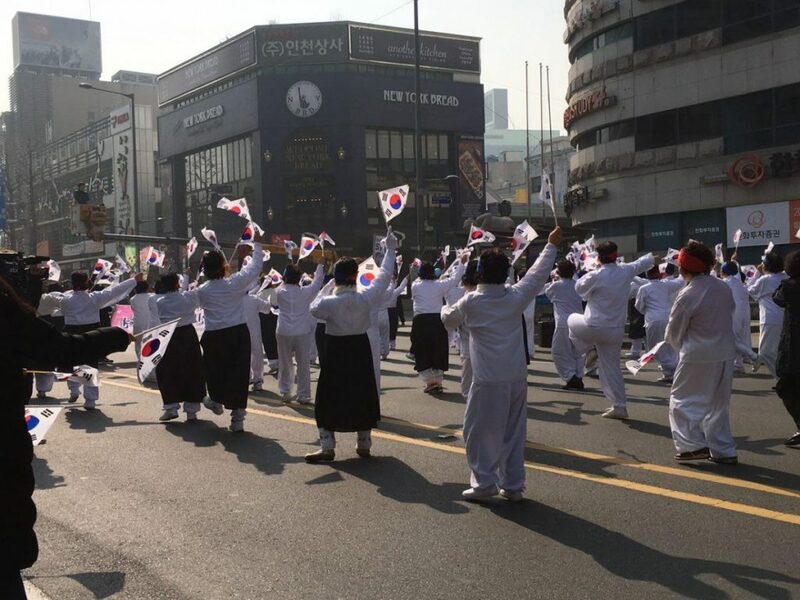 This celebration held all over the world, and in Washington, D.C.
HWPL’s peace movements are assessed by experts as they have never really seen them. In other words, it is unusual to achieve such achievements in such a short period of time. Their movements are like lightning and they are working at the risk of their lives. Campaigns are being held in 83 cities around the world, including South Korea, the United States, Germany, Britain, Australia, South Africa and Turkey. Peace letters, which were collected through the campaign, were delivered to heads of 193 countries on 14th of March. Why does DPCW have explosive supports? Starting with Seychelles, Eswatini, and Comoros, official support for the DPCW at the governmental level is increasing. International organizations’ support and participation for the DPCW have continued. PARLACEN (Central American Parliament) passed a resolution in support of the DPCW. 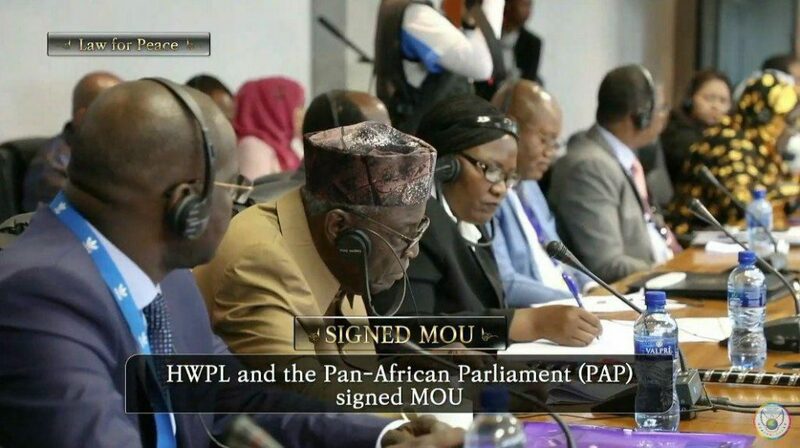 The Pan-African Parliament, which is the legislative body of the African Union consisting of 55 African countries, and the International Centre for Black Sea-Baltic Studies and Consensus Practices signed memoranda of understanding. 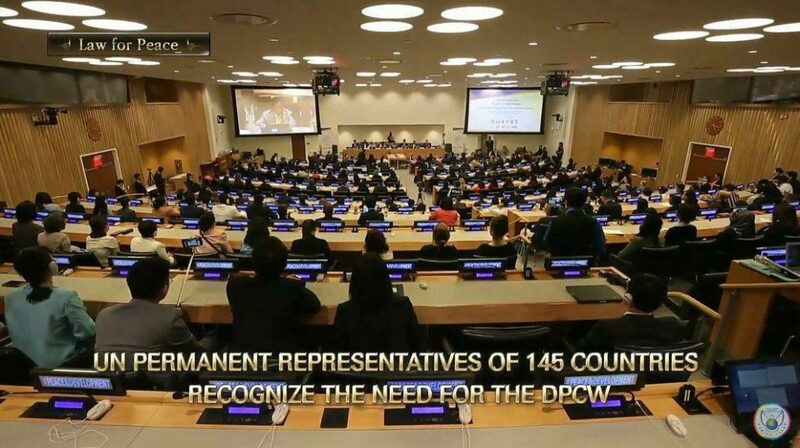 Also in May 2018, at the UN Headquarters in front of the UN Permanent Representatives of 145 countries, HWPL made known the importance of introducing the DPCW to the UN in the form of a draft resolution and establishing a binding instrument for peace. HWPL’s “Legislate Peace” Campaign is an advocacy campaign at the civilian level in support of the DPCW and its implementation, and it is taking place in 174 countries around the world. 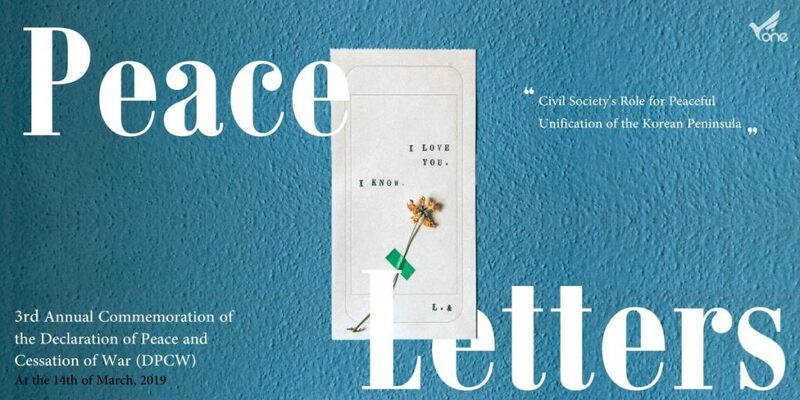 This campaign includes peace education that can raise awareness of peace among citizens, students, and refugees, “Peace Letter” Campaign where the youth call for peace in letters to national leaders, and peace projects and advocacy activities for improving women’s rights. What day is it today? D-Day! 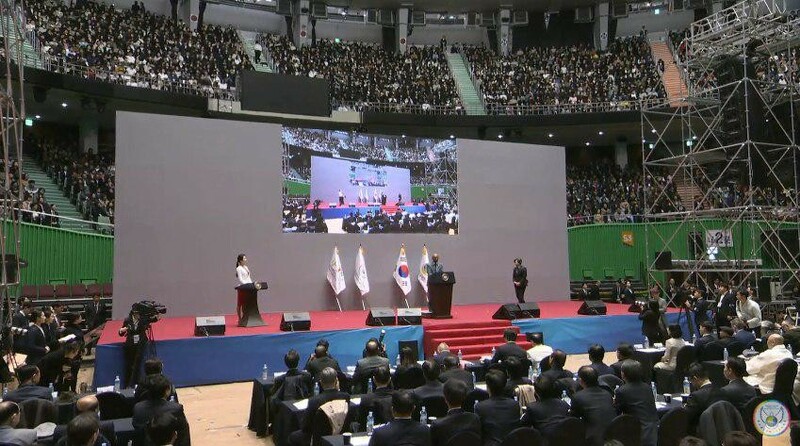 The 3rd Annual Commemoration of the Declaration of Peace and Cessation of War (DPCW) was held on 14 March 2019 in Seoul, Korea and other major cities around the world. They shared the outcomes of activities undertaken to introduce the 10 articles and 38 clauses of the DPCW to the United Nations and the present status of the international community’s support. 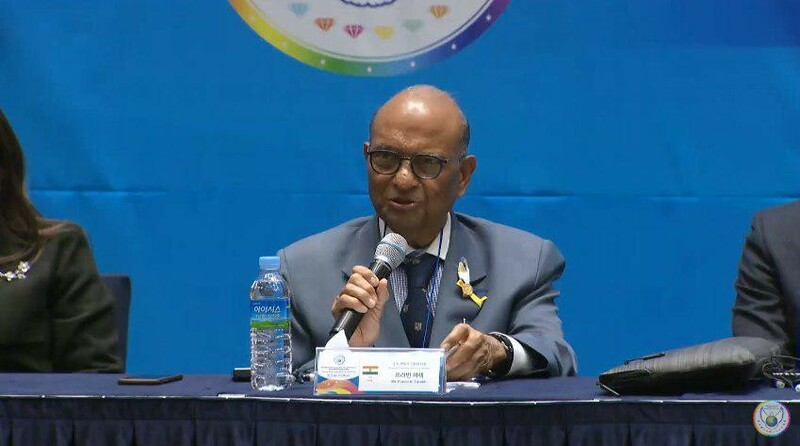 Mr.Pravin H. Parekh, President of the Confederation of Indian Bar and HWPL International Law Peace Committee Chairperson, said “I am very happy to attend the 3rd Annual Commemoration of the DPCW to review and discuss the inclusion of DPCW in the curriculum of law school students in order to achieve real world peace. Mr.Man Hee Lee created the right consciousness of students and teachers around the world. The Chairman Lee is committed to ensuring that all countries and citizens have a dream of achieving world peace. He says that world peace can be achieved when there is supports from all countries around the world, as well as the support of UN, UNESCO and UNICEF. Mr.Lee continues to contact not only the United Nations and other international organizations, but also the rulers and intellectuals of other countries for world peace. 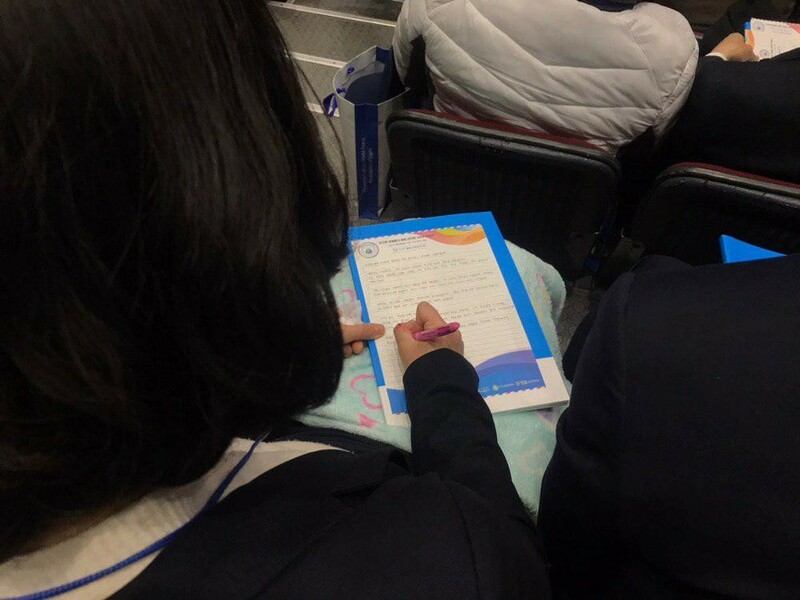 Young people, including schools and universities, are huge supporters of HWPL. We are fighting for a harmonious world against clearly exceeding cruelty, violence and imbalance. 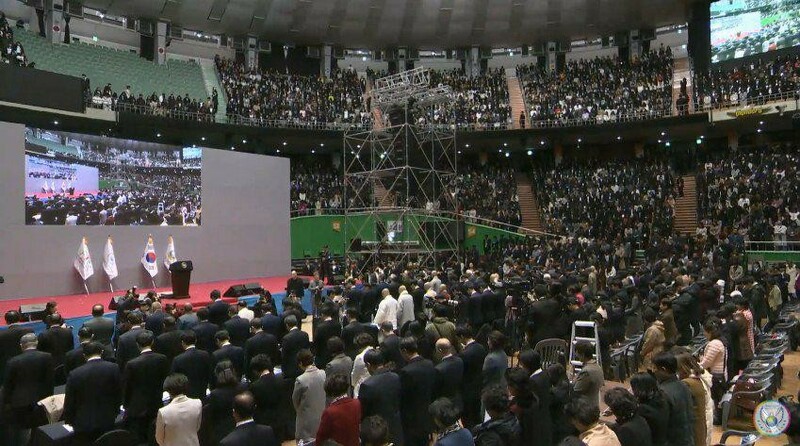 Also, around 30,000 participants discussed the role of civil society for peaceful unification of the Korean Peninsula. 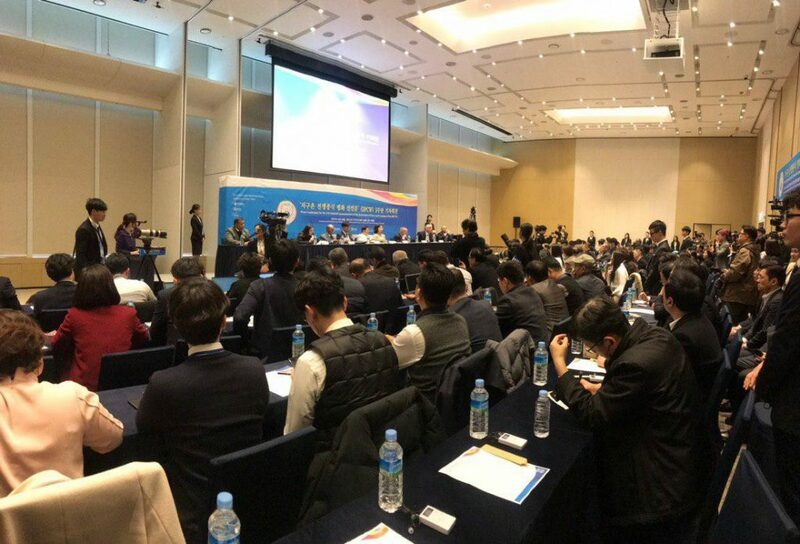 Through a lecture on “Civil Society’s Role for Peaceful Unification, Exchange, and Cooperation of the Korean Peninsula,” there will be a discussion on cooperation for building up social consensus on peace and unification among civil society. 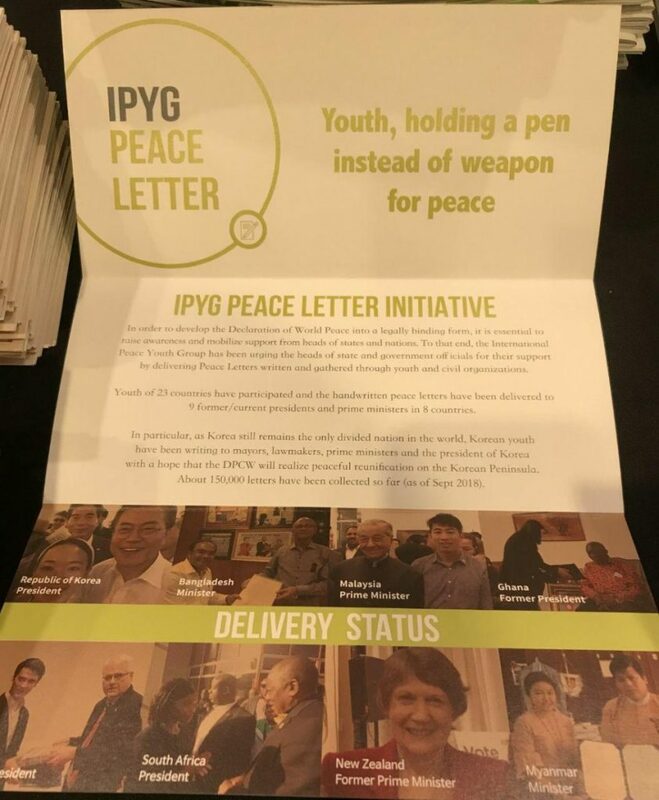 They also had time to write peace letters to President Moon Jae-in as a kind of “Peace Letter Campaign.” What did they say to the president? The President Moon is now in Malaysia. ASEAN is very important to Korea. At the interview with Asia News Network, President Moon emphasized “Peace & Prosperity.” He’s really made a lot of effort for peace so far. 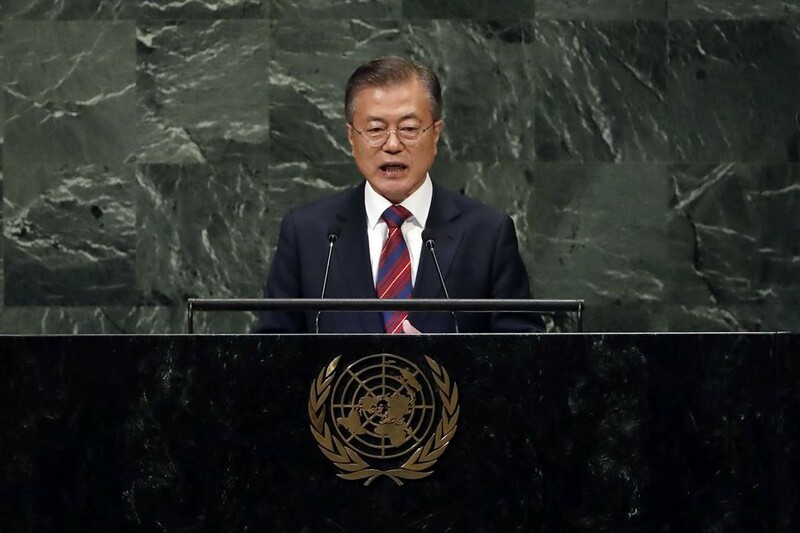 From the PyeongChang Peace Olympics to Inter-Korean summits with Kim Jong-un, Moon placed the greatest value on peace. Hello, Mr. President. I am a college student who loves peace. I know that you are always trying to make peace and that you are still working hard. But I know it’s a lot of trouble. Like Socrates, you’re acting as a midwife, but there are times when things don’t work out. As a Korean, I am studying abroad in Sydney now, but I am very sorry. I remember you, Mr. President, who was a human rights lawyer. Human-centered politics has touched the hearts of countless people. 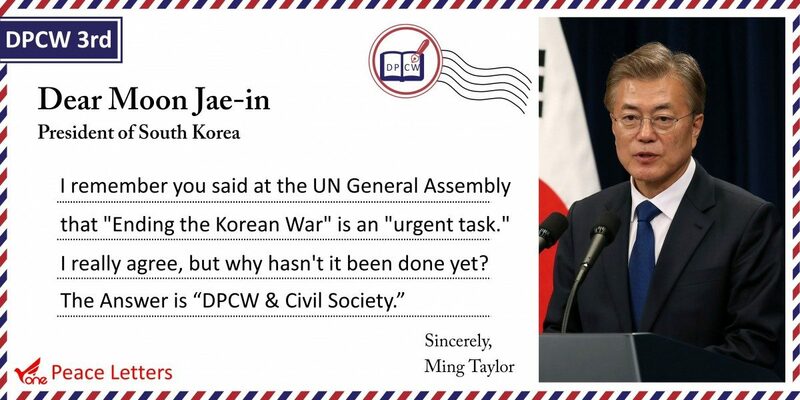 Also, I remember you said at the UN General Assembly that “ending the Korean War” is an “urgent task.” (Reference) I completely agree with you. But why hasn’t it been done yet? Do you know how to achieve peace on the Korean Peninsula? How on earth can we do this? The answer is “Civil Society.” The Role of Civil Society is really important. That’s why HWPL associated with IPYG and IWPG. IPYG brings 1.8 billion young people from all over the world together and IWPG brings 3.7 billion women from all over the world together. If citizens around the world shout in one direction with one voice, which leader can stop it? We can do it. You can’t do it because you don’t. DPCW, declared on March 14, 2016, was created by 21 prominent international law professionals, “The HWPL International Peace Law Committee.” H.E. 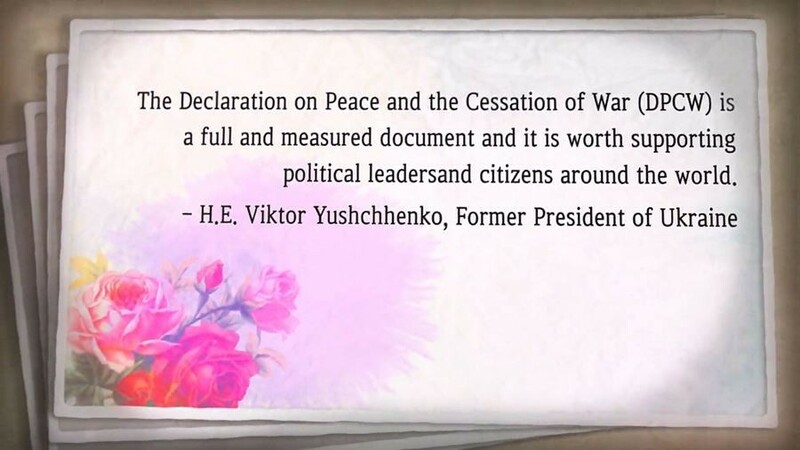 Viktor Yushchhenko, Former President of Ukraine, said “The Declaration on Peace and the Cessation of War (DPCW) is a full and measured document and it is worth supporting political leaders and citizens around the world.” In particular, I think the Article 5 of the DPCW can help us. Some of the following are excerpts. 1. The duty of every state to refrain from the threat or use of force against the territorial integrity or political independence of any other state includes the duty not to engage in any action that would result in the dismemberment of any state, or force the secession or annexation of any territorial unit from that state. 2. Subject to the right to self-determination of peoples, states shall not engage in any intervention that seeks to divide or separate a state in a manner that is contrary to the rules of international law. 3. Subject to the provisions of the present article, States should encourage identifiable nation-states that have been divided by longstanding external or historical factors to engage in co-operation and dialogue. States should ensure that divided peoples are provided with their right to self-determination, including, inter alia, measures which may result in unified government. 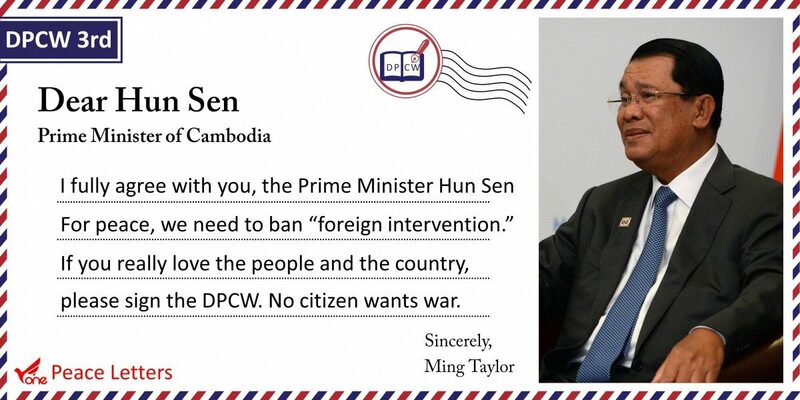 if you really love the people and the country, please sign the DPCW! 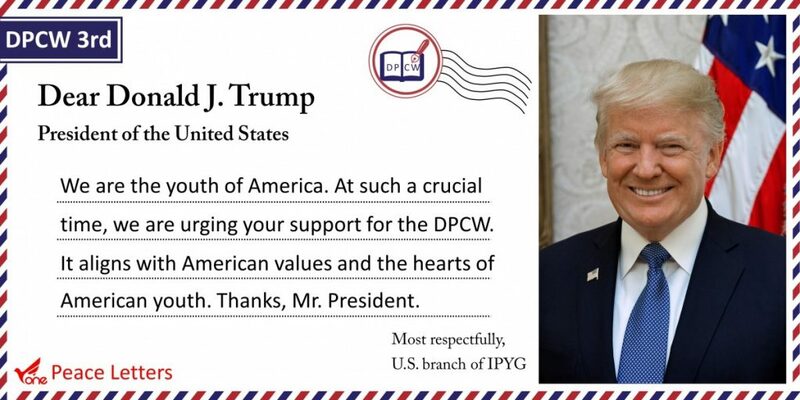 IPYG all over the world is urging presidents from around the world to sign the DPCW. 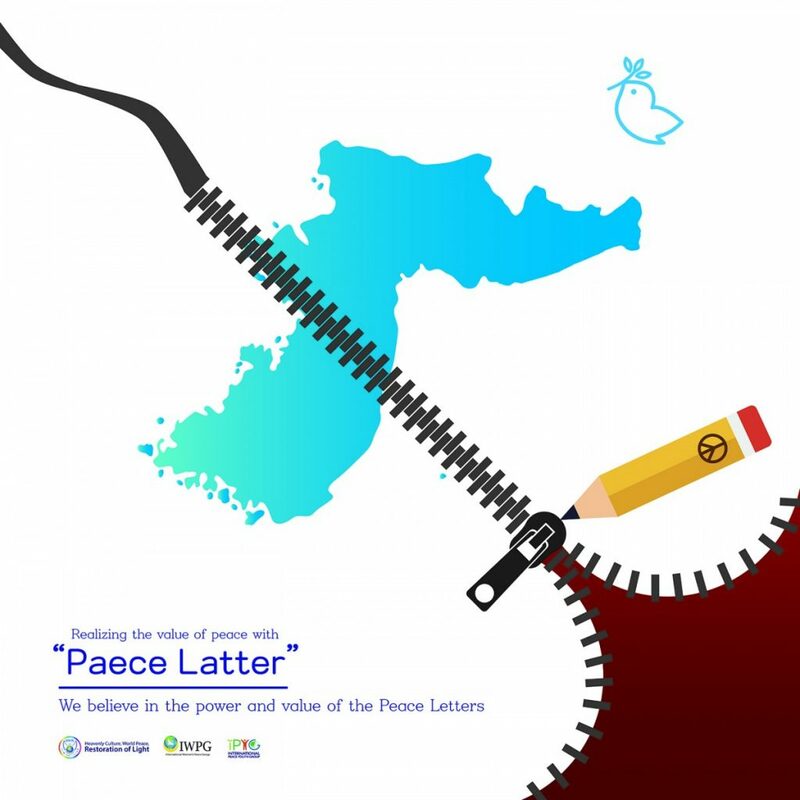 In less than a year, 165,782 Peace Letters were collected. DPCW already has national supports such as Seychelles, Eswatini, and Comoros. In 2017, the central american parliament passed a resolution in support of the DPCW. Also, the Pan-African Parliament (PAP), which represents all citizens of 55 countries of the African Continent, the International Centre for Black Sea-Baltic Studies and Consensus Practices (Centre BBS), which consisted of former European Presidents, and 145 United Nations officials also supported the DPCW. Please support the DPCW to be introduced into the U.N. resolution and to be legally binding all over the world. It’s our Korea that put a gun to our fellow countrymen’s chest. You know the pain of war, don’t you? Why should we be divided under longstanding external and historical factors? It is the only divided country in the world. Who can pay back the lives of countless young men who died in the war? Mr. President, I don’t want to die. I want to love, dream and sing. Your choice is very important now. Please sign the DPCW. If not, please let me know why. We can do it! Why not? I don’t want you to be remembered as a president to future generations who wanted war. I hope you to be remembered as the president who took the lead over anyone else for peace. Pleas write back. Thanks for reading my peace letter, President Moon Jae-in. What is HWPL? Peace letter for What? This tweet is mine. 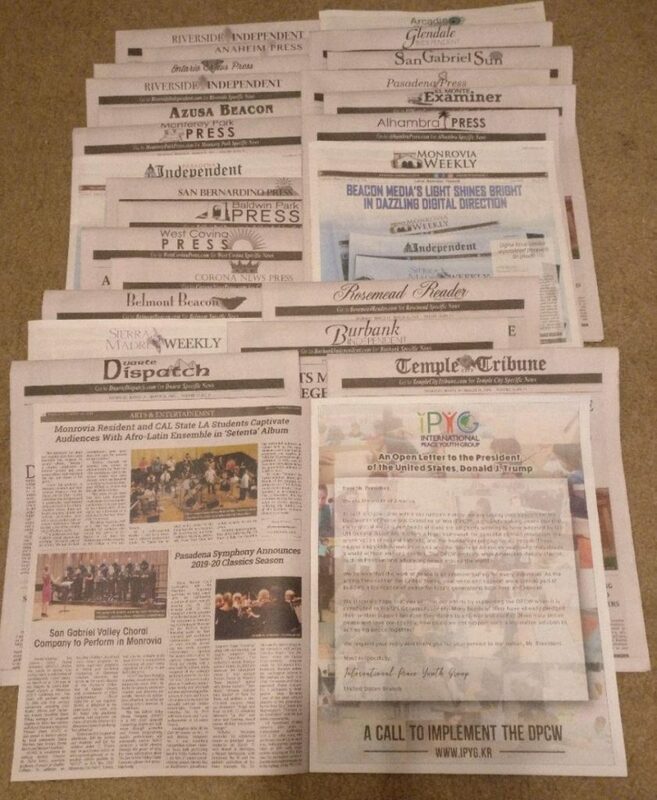 I often look for news of peace, of which HWPL stands out and I frequently tweets. Have you ever wondered what is HWPL? First of all, HWPL is considered the most powerful and practical international NGO. Their short-term achievements are truly remarkable. That’s because HWPL risked his life. Heavenly Culture, World Peace, Restoration of Light (HWPL) means to achieve world peace through heavenly culture and restore light. With the purpose of restoring the global community that has been suffering due to wars and conflicts, HWPL wants to go beyond the barriers of culture, religion and beliefs, to respect the core values of peace and life. All individuals, as the messengers of peace, are working together to make a world of SDGs and DPCW. 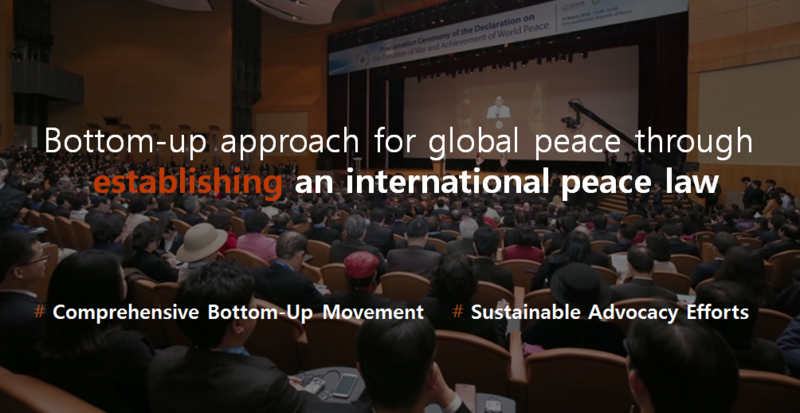 HWPL, the host of this event, is a peace NGO in Special Consultative Status with the UN ECOSOC and associated with the Seoul Metropolitan Government and the UN DGC. 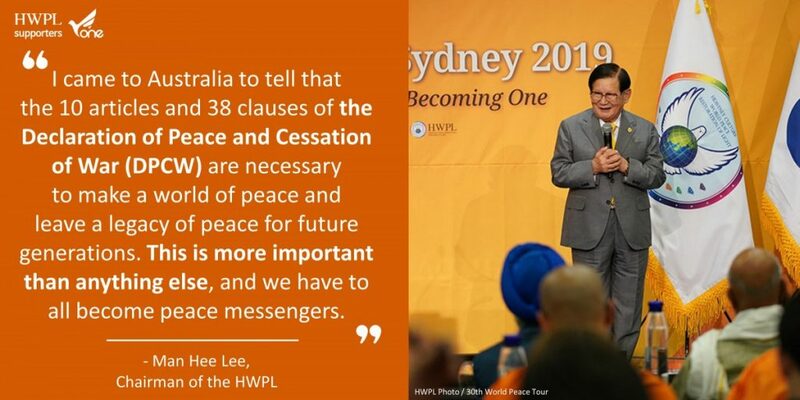 For the purpose of ceasing all wars and creating a peaceful world as a legacy for future generations, HWPL is building a global peace network. 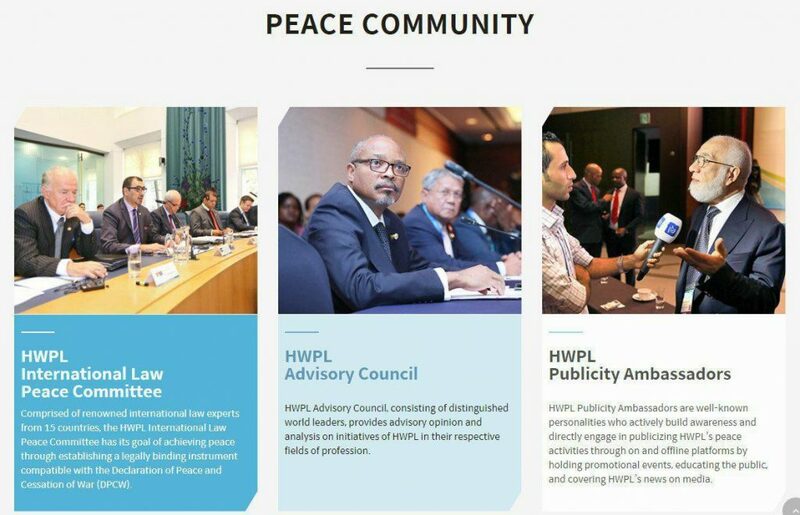 This network includes the HWPL International Law Peace Committee made up of international law experts, 192 members of the HWPL Peace Advisory Council made up of political and community leaders, and 556 HWPL Publicity Ambassadors made up of religious leaders and experts in education and media. 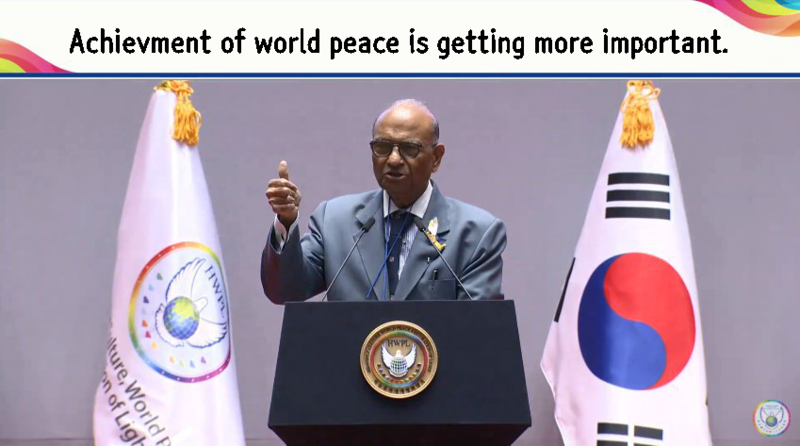 Also, HWPL is cooperating with the International Women’s Peace Group (IWPG) and the International Peace Youth Group (IPYG), which has about 830 youth groups around the world as its affiliates, to lead civil society’s support and participation in building global peace. They are gathering the support of the civil society. 1.8 billion Youth and 3.7 billion Women are the main character. Campaigns are being held in 83 cities around the world, including South Korea, the United States, Germany, Britain, Australia, South Africa and Turkey. 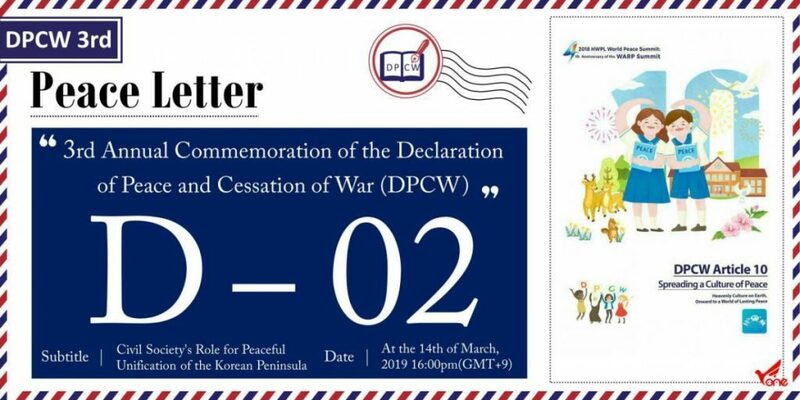 On March 14, 2019, 3rd Annual Commemoration of the Declaration of Peace and Cessation of War (DPCW) is being held now. Peace letters, which were collected through the campaign, will be delivered to heads of 193 countries at the same time today. 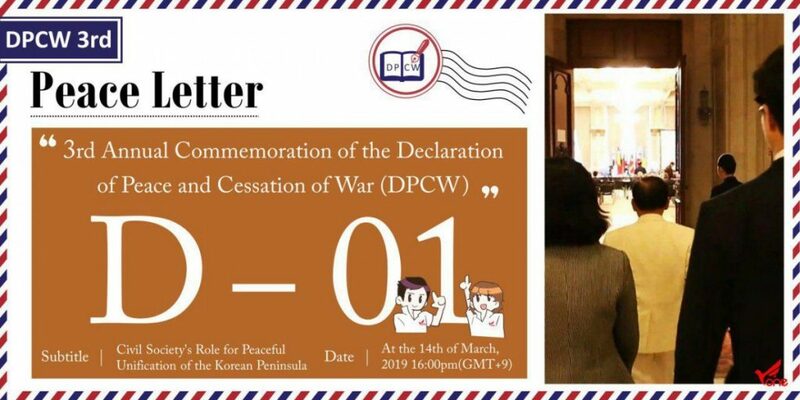 At the 14th of March, 2019 2:15pm (GMT+9), HWPL has shared the results of its previous activities to bring the DPCW to the United Nations and the status of international support for the DPCW. 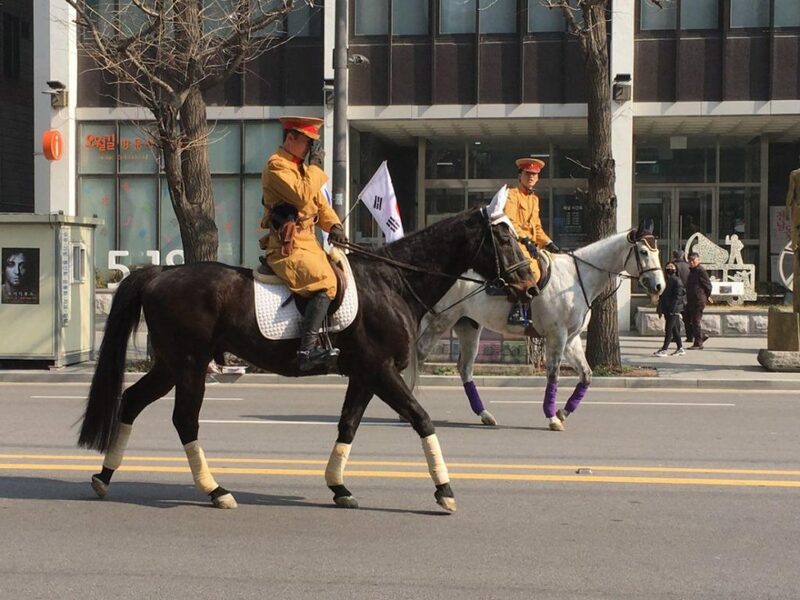 Author masterPosted on 2019년 March 14일 2019년 March 22일 Categories About me :)Tags 3rd DPCW, 3rdCommemoration, chairman Lee, DPCW, HWPL, InternationalLaw, IPYG, IPYG peace letter campaign, IWPG, Manheelee, Peace Letter, PeaceLetter, PressConference, What is HWPL, WorldPeace1 Comment on What is HWPL? Peace letter for What? 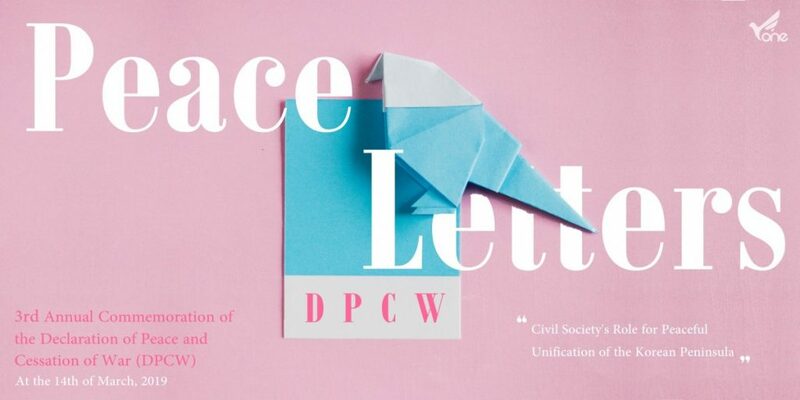 The 3rd Annual Commemoration of the Declaration of Peace and Cessation of War (DPCW)1 is to be held on 14 March 2019 in Seoul, Korea and other major cities around the world under the subtitle, “Civil Society’s Role for Peaceful Unification of the Korean Peninsula.” This event will serve as a platform to share the outcomes of activities undertaken to introduce the 10 articles and 38 clauses of the DPCW to the United Nations. What day is March 14th? On March 14th, Heavenly Culture, World Peace, Restoration of Light (HWPL) will do a great job. It is a milestone that has never been made before. Why hasn’t anyone gotten rid of the war so far? How does current international law work? The problem of current international law is that it is not legally binding. So, the “HWPL International Law Peace Committee”, a group of 21 eminent experts in international law, enacted a completely different international law. 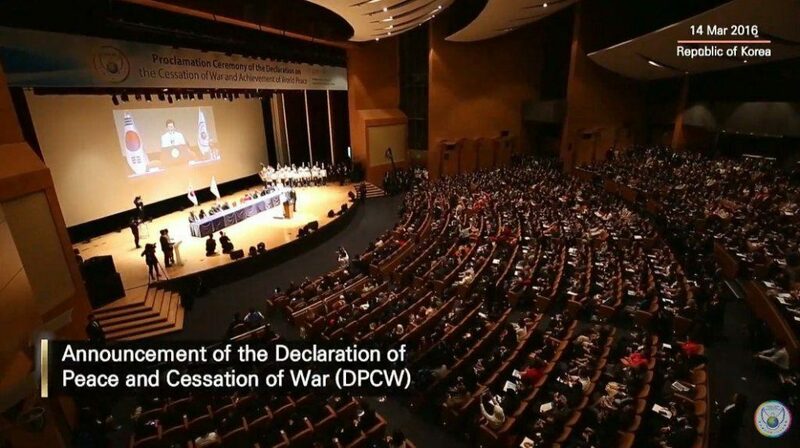 On March 14th, 2016, the Declaration of Peace and Cessation of War (DPCW) was declared. 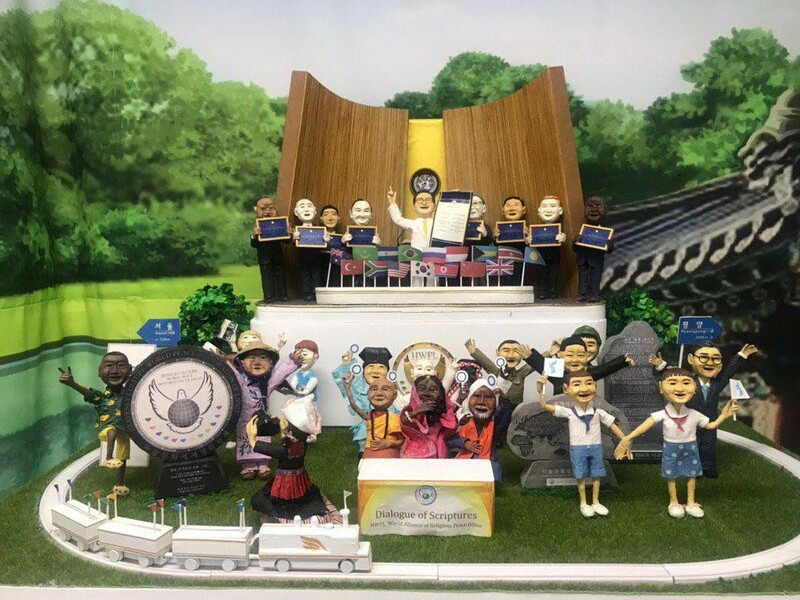 Since then, HWPL has been holding an annual commemoration of the DPCW every year to present the outcomes of creating and spreading a culture of peace based on worldwide support for the DPCW. The most important thing is to share the progress of activities undertaken to introduce the DPCW to the UN, which is part of the implementation process. After 2 days, 3rd Annual Commemoration of the Declaration of Peace and Cessation of War (DPCW) will be held in Seoul. 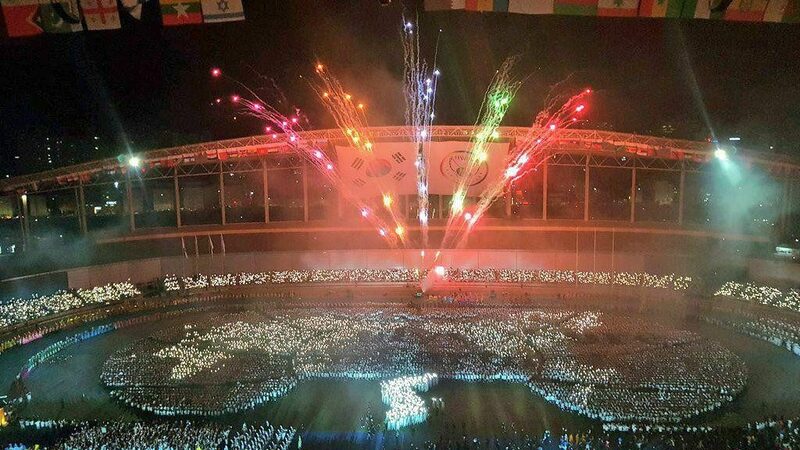 Around 30,000 peace lovers are expected to participate. How does DPCW become a legally binding international law? 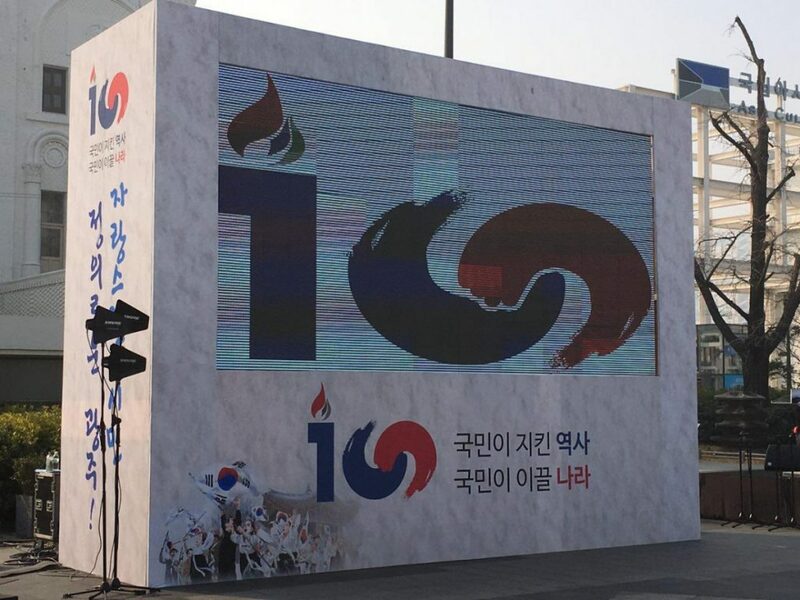 The answer is “Civil Society.” That’s why the event’s subtitle is “Civil Society‘s Role for Peaceful Unification of the Korean Peninsula.” They are the Youth and the Women. If all the young people and women in the world put one voice in one direction, which leader can stop it? So, the International Peace Youth Group (IPYG) and the International Women’s Peace Group (IWPG) are moving very actively to achieve peace. In less than a year, 165,782 Peace Letters are sent to 193 Current Presidents of member nations of the UN. The purpose is to call for support for the passage of the DPCW as international law. Below is my peace letter. I fully agree with you, the Prime Minister. You said that the history of the recent conflict in Cambodia was caused by foreign intervention. Your message seems to reflect the reality exactly. 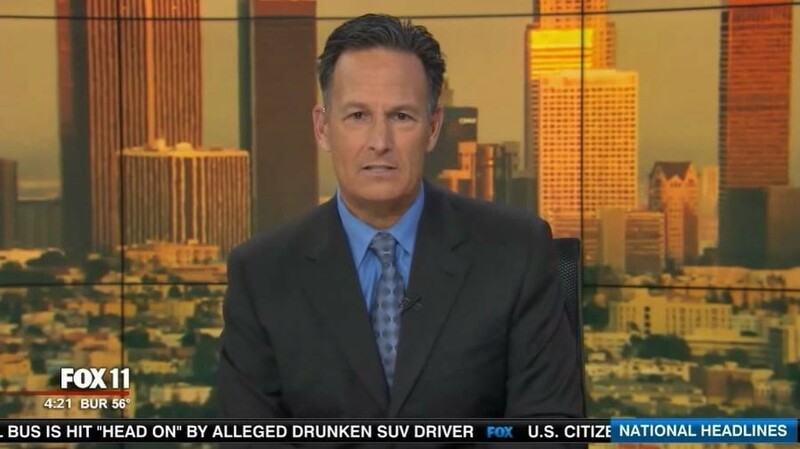 As a young man who went through the war in person at that time, I think you know better than anyone how painful it was. 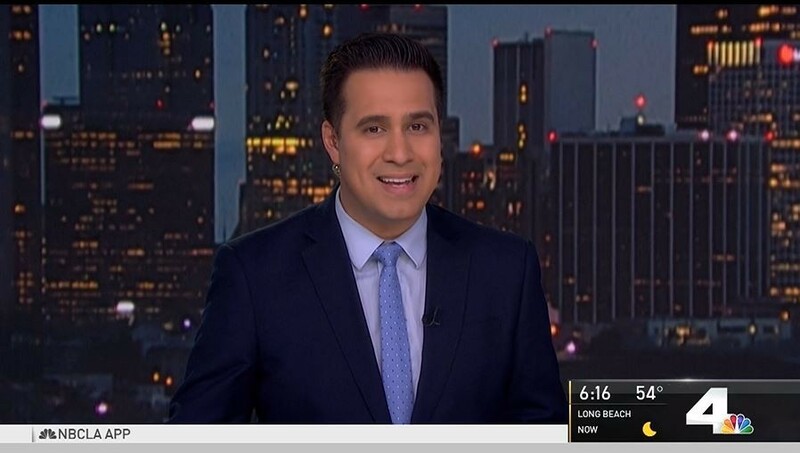 I remember saying, “My youth has no peace, no happiness, one eye has a disability, and I’m sick and tired of the war and the parting of my loved ones.” Who dies in war? Youth! He is my friend and he is someone’s son. As a young man, I’m very interested in peace. I’m from Korea, the only divided country in the world. Because of foreign intervention, which was two powerful powers, we became two countries, two peoples. In the tragedy of shooting at our own people, many young people had to die. The sound of gunfire, cannons, jets, and bombs split young people’ ears. Shot to death, Starved to death. This is the tragedy of the same race. Our country is still a divided country, and danger lurks. So I could sympathize more with the suffering of the Cambodian people. There was a civil war by the end of the 1980s, and ‘foreign intervention’ is making the people more painful. Now, thanks to Prime Minister Hun Sen, Cambodia has achieved a lot of political stability, but shouldn’t there be a lasting peace? What can you give to future children as the best legacy? It is a lasting peace! I would like to speak to you about the 10 articles and 38 clauses of the “Declaration of Peace and Cessation of War” (DPCW) which has recently been supported as “Answer To Peace” by former and incumbent presidents, the National Assembly speaker, and so on. 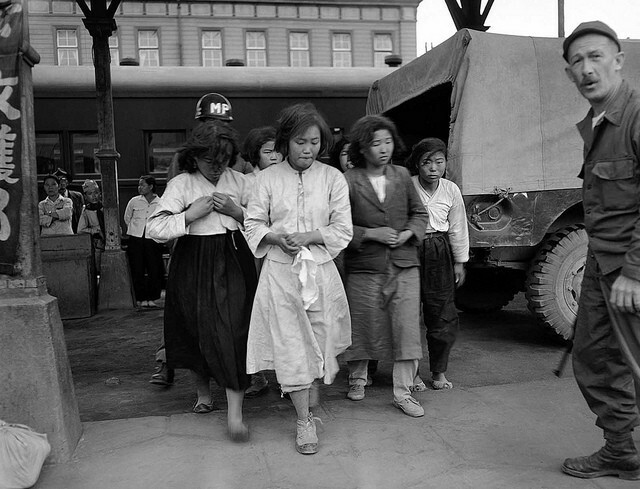 One historian said “China, Russia and the U.S. tried to put the world’s countries in their political arena and provoked them with money, weapons and political assurance strategies.” I would like to talk to you about DPCW’s provisions that reflect the realities of Cambodia at the time when peace was desired more than anyone else. 4. States should abstain from interference in the internal conflicts of other States. 3. Every state has the duty to refrain from any act of incitement, planning, preparation, initiation or commission of an act of aggression by a state, a group of states, an organization of states or an armed group or by any foreign or external entity, against the sovereignty, political independence and territorial integrity of any State. In particular, when it comes to “Killing Fields” where the Khmer Rouge regime forced or massacred nearly two million people (one third of its seven million people) for three years and seven months, the Solution is the Article 9 of the DPCW. 2. States should take measures to ensure that religious belief or ethnic identity are not utilised as a pretext for gross and systematic acts of violence. In circumstances where individuals or groups perpetrate or assist in such acts in the name of their religion, states should take adequate measures that lead to the prosecution and punishment of such activities. Please Sign the DPCW! We Are One! The current international law cannot end conflict and war. This is because it is not legally binding. 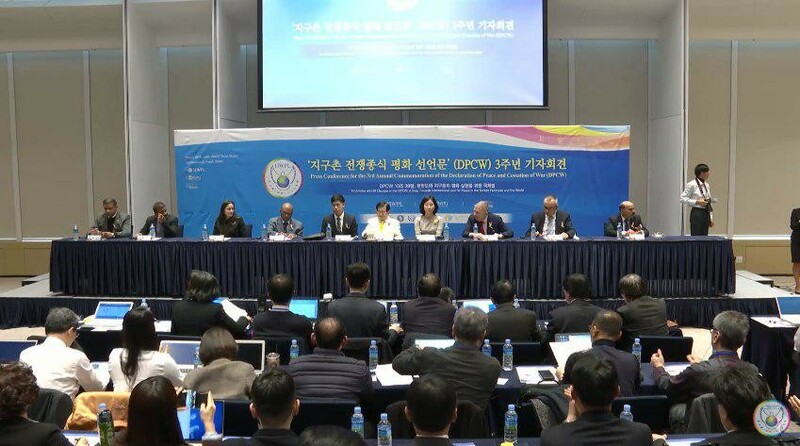 Thus, the “HWPL International Law Peace Committee”, which has gathered 21 renowned international law experts from all over the world, declared the DPCW to improve the problems of current international law. If the DPCW is presented as a resolution to the UN General Assembly and supported by two-thirds of the ambassadors, peace can be achieved. 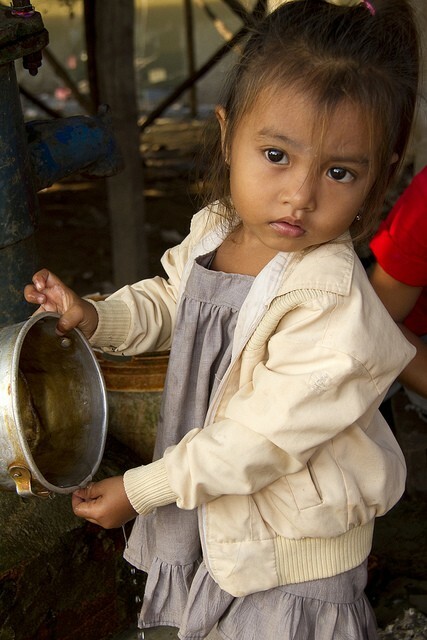 Prime Minister Hun Sen, if you really love the people and the country, please sign the DPCW! 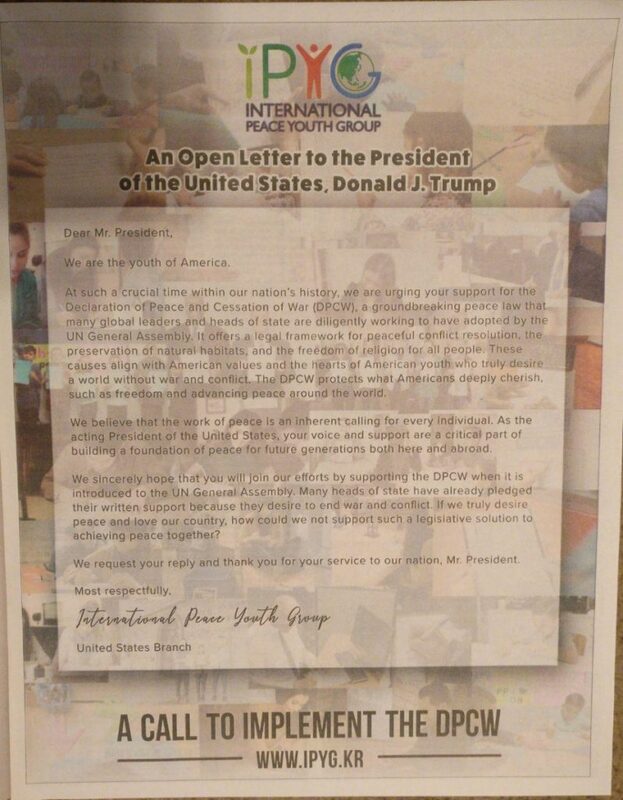 IPYG all over the world is urging presidents from around the world to sign the DPCW. 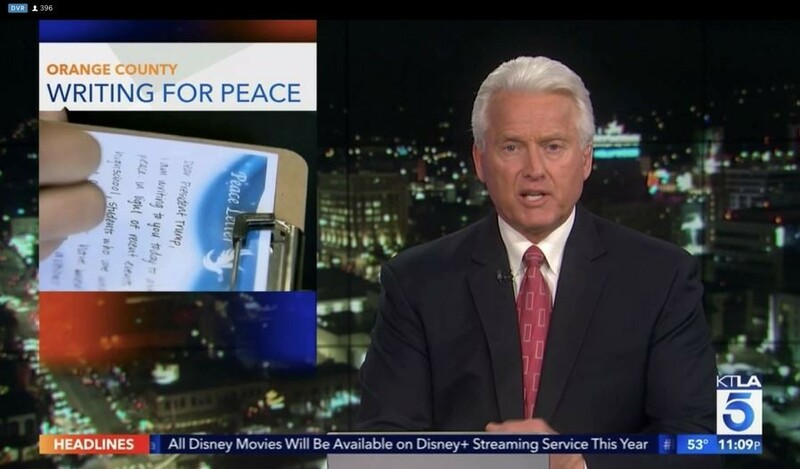 In less than a year, 165,782 Peace Letters were collected. The Pan-African Parliament (PAP), which represents all citizens of 55 countries of the African Continent, the International Centre for Black Sea-Baltic Studies and Consensus Practices (Centre BBS), which consisted of former European Presidents, and 145 United Nations officials also supported the DPCW. Please support the DPCW to be introduced into the U.N. resolution and to be legally binding all over the world. Why is the DPCW the answer to peace? The answer is in the “Civil Society”. That’s why HWPL is joined with the International Peace Youth Group (IPYG) and the International Women’s Peace Group (IWPG). At the Center of HWPL, there is Mr.Man Hee Lee who is a veteran of the Korean War and called the “Father of Peace”. He’s risking his life for old age and working for peace. That’s why 1.8 billion young people and 3.7 billion women all over the world support the Chairman Lee. If all citizens speak one voice in a single direction, which leader can ignore citizens? There is “No Citizen” who doesn’t want peace. 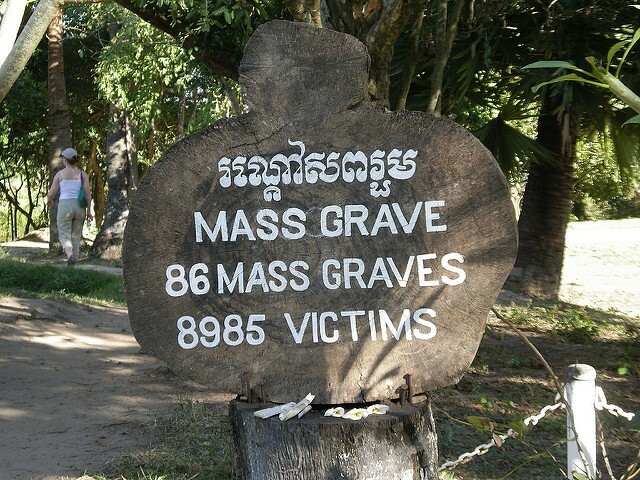 I heard from a Cambodian friend that because of the painful history of ‘Killing Fields,’ young people under the age of 30 now account for more than 70 percent of the total population. If peace can be established, Cambodia has the potential to become an advanced country more than any other country. Who would be the first to die in a war? It’s young people. These young men don’t want war, they want peace. I think maybe you don’t want to pass on “the youth of yours, when there is no peace and happiness.” But if you don’t take any action, we have no choice but to think you love war. Prime Minister Hun Sen, if you make a right choice in this time of year, you will remain a lasting record for future generations, and the future will remember your name and praise you. Please reply. Thank you for reading my peace letter. 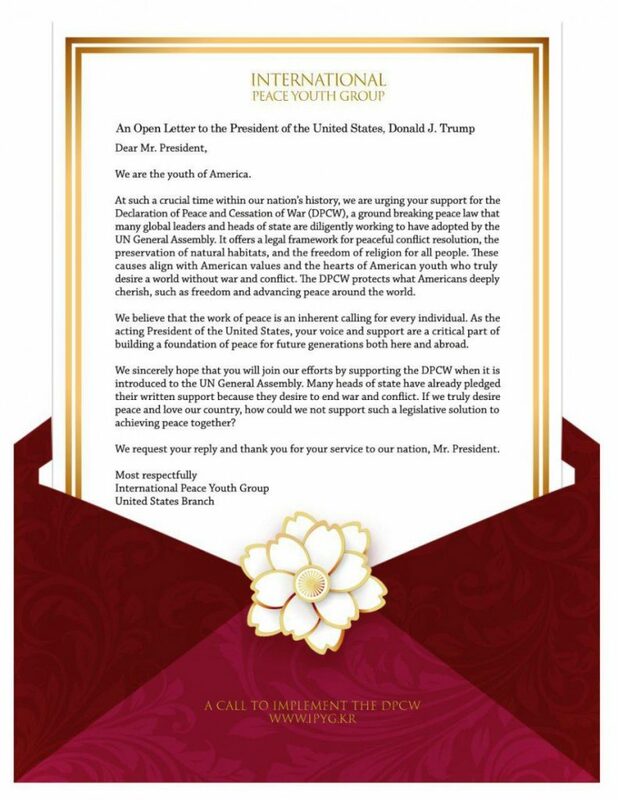 At the 14th of Mar., 2019 16:00pm (GMT+9), Youths from all over the world will send peace letters to 193 incumbent presidents and U.N. ambassadors. This peace event will be broadcast live on YouTube. Now, what should young people do? In order to develop the Declaration of Peace and Cessation of War (DPCW) into a legally binding form, it is essential to raise awareness and mobilize support from heads of states and nations. 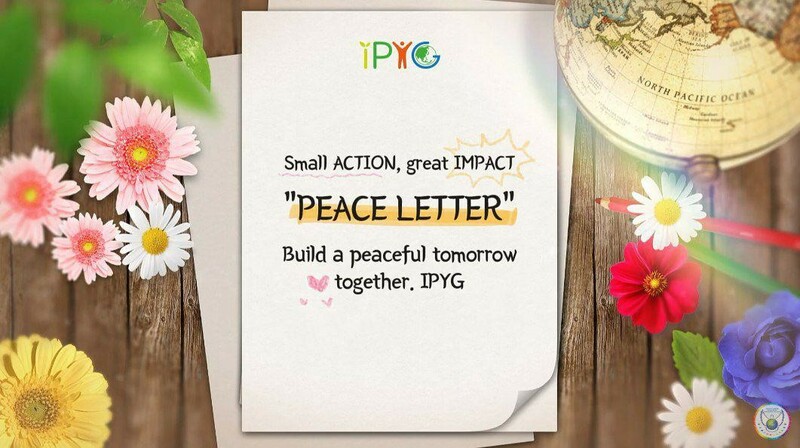 To that end, the International Peace Youth Group (IPYG) has been urging the heads of state and government officials for their support by delivering Peace Letters written and gathered through youth and civil organizations. Youth of 23 countries have participated and the handwritten peace letters have been delivered to 9 former/current presidents and prime ministers in 8 countries. Why is DPCW the Answer to Peace? What is the difference between existing international law? The biggest problem with international law at present is that it is not legally binding. Therefore, DPCW includes the direction of legally binding and legal force. The existing international law contains elements in which a powerful nation can create disputes along its interests. According to Article 1 “Prohibition of the threat or use of force” and Article 3 “Friendly relations and the prohibition of acts of aggression”, States should abstain from interference in other States, whatever its motives or purposes. And States should condemn the illegal occupation of territory and should criminalize in their domestic law. 10 Articles of the DPCW consisted of “Conflict prevention (Article 1~5) “, “Conflict mediation (Article 6~7)” and “Securing sustainable peace (Article 8~10).” Conflict prevention encourages states to cooperate in gradual disarmament, repurpose weapon-manufacturing facilities for the benefit of humanity. And don’t invade. When there are interstate problems, the state itself decides its own fate. How can do the DPCW mediate Conflict? Through the UN Security Council, the International Court of Justice, other judicial bodies, regional judicial arrangements, the DPCW will settle disputes. Then you may be able to ask this question. “How can international peace be maintained through the UN Security Council when the UN Security Council is now composed primarily of powerful nations?” But the DPCW involves changing international organizations like the United Nations Security Council to function properly. Lastly, Securing sustainable peace is important for future generations. Religion is the most important part of people’s ideology. In other words, this is a factor that can cause conflict among people. In fact, it accounts for 80 percent of the causes of war. Therefore, religion should be united, and religious leaders should take the lead in the peace movement. And through peace education for young children, it creates an eternal culture of peace. How can peace be achieved with DPCW? The answer is “Civil Society!” That’s why HWPL works with IPYG and IWPG. Peace comes when all citizens around the world are watching. The President cannot ignore the people. The owner of the state is the people, and the president is not at his disposal because the people vote. When citizens around the world shout in one voice, in one direction, nothing can ever ignore it. A national leader can’t help but keep up with the citizens. The HWPL is where 1.8 billion Youth and 3.7 billion Women gathered to achieve peace. 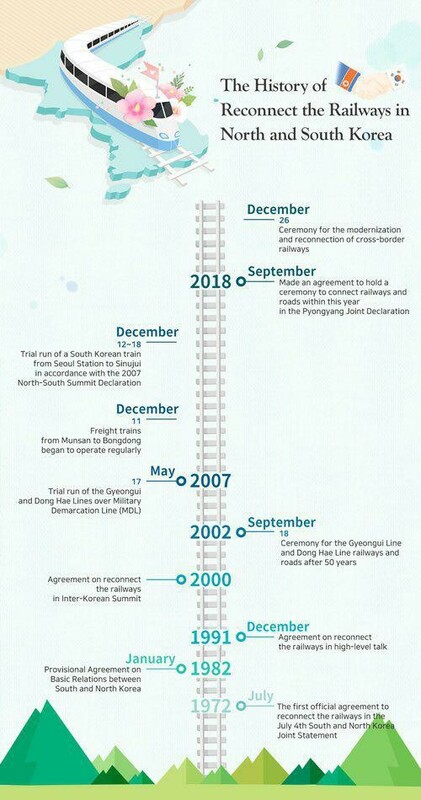 So, in order to achieve the ultimate goal of implementing a legally binding international instrument based on the DPCW, HWPL is encouraging states for the submission and adoption of the document at the UN General Assembly. It must get votes in favor at least two-thirds of the 193 ambassadors of the United Nations member states. 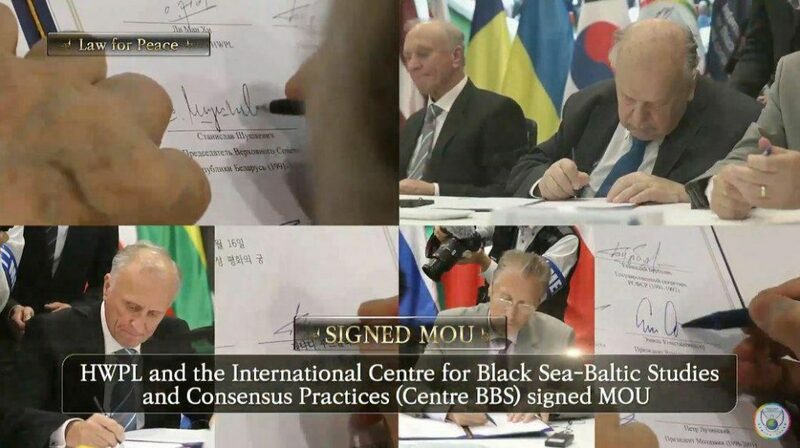 In Europe, the International Centre for Black Sea-Baltic Studies and Consensus Practices (Centre BBS), which is headed by a group of former European national leaders, signed the MOU with HWPL. Not at all, Seychelles, Eswatini, and Comoros expressed support for the DPCW at the NATIONAL LEVEL. At 14th of March, 2019, It will be held all over the world. 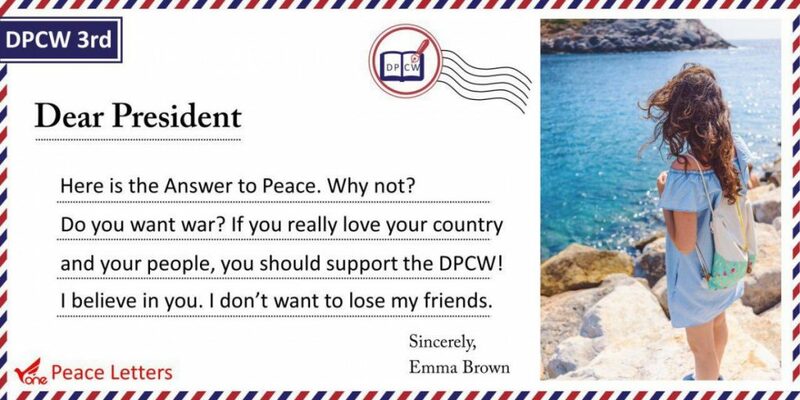 On 14th of March, Everyone in the world should write Peace Letters to support the DPCW. “Dear President, Here is the Answer to Peace. Why not? Do you want war? If you really love your country and people, you should support the DPCW.” What is your choice? Endless War or Peaceful Future? This choice now we do will be remembered forever in future generations. 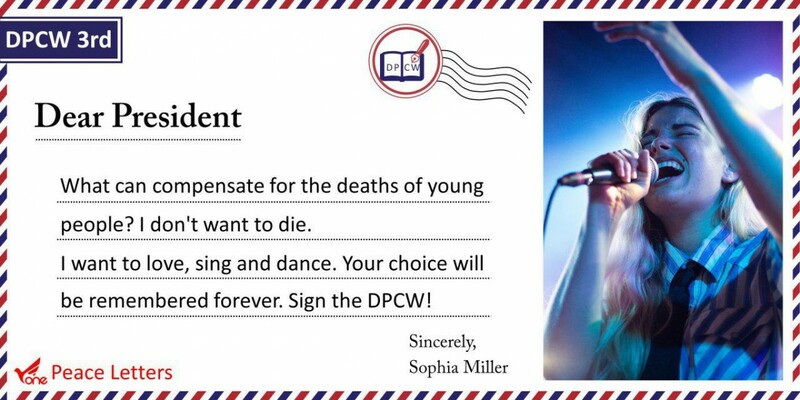 Sign the DPCW! Mr. President, did you receive our peace letters? Please write back. This is a time of peace. All things have helped us. So, our beginning is a success.